When Fuller Center Director of International Field Operations Ryan Iafigliola visited Nicaragua in January 2012, he came back with a new covenant partnership — and an image he could not shake. While touring the quaint Pacific Coast fishing village of Las Penitas, he saw the most pitiful of shacks. At the shack, he encountered the most happy and generous family. It was there that Jazmina and her husband Carlos lived with their four children — Jose, Cindi, Carlito and Yasser. The children could not contain their laughter as Iafigliola practiced his Spanish with them. He could not get those children’s smiling faces out of his head and was thrilled to learn that the family was selected as the first partner family to build a new home with the Nicaraguan Fuller Center. 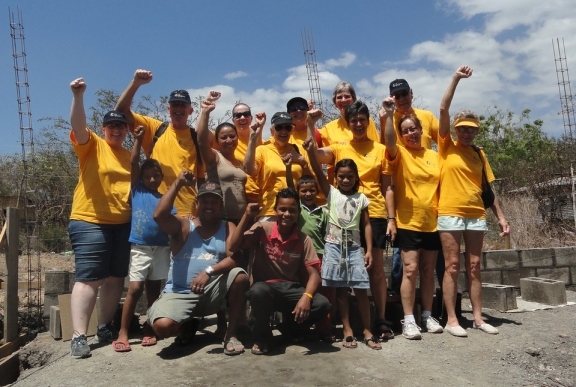 That build began two weeks ago when Brenda Sawyer led the very first Fuller Center Global Builders trip to Nicaragua — where they were received by some as family and others as rock stars. The work continued last week with the second Global Builders trip to Nicaragua by a team from Georgia Southwestern State University. Volunteers on the trip know exactly why the family made such an impression on Iafigliola; after working alongside the family all week long, the volunteers developed a deep affection for the family. The youngest member of the family, 4-year-old Yasser, took a special liking to Turner-DeJesus. Both Turner-DeJesus and Sawyer have made multiple build trips, so they have seen many shacks like the family’s home that sits directly adjacent to the new home that is nearly complete. So they were not in shock at the sight. But they were impressed with how the proud family kept their home as well as they could. While the volunteers spent much time with the family under the shelter that amounts to their outdoor living room and kitchen, they did not see where the family slept until the last day. Turner-DeJesus and Sawyer also have met many grateful, hard-working families before. But an especially strong bond formed on this first Nicaraguan build between the volunteers and the family. That bond was never more evident than when it was time to leave. But the volunteers did not bond only with the family. The entire community around Las Penitas welcomed the team. Though it was the very first Global Builders trip to Nicaragua, Sawyer’s team gave the local group rave reviews for its organization. That has a lot to do with the fact that the team behind the Nicaraguan Fuller Center was ready to hit the ground running seven years after having first contacted Fuller Center founder Millard Fuller about joining the ranks. Also, Sawyer had extensive previous experience building in Nicaragua with Habitat for Humanity. No one was happier to hear the glowing reports than Iafigliola. 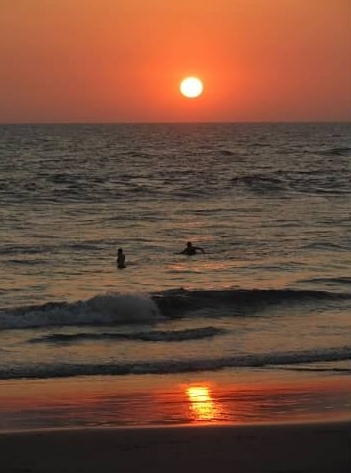 While the build experience went well, the covenant partner was well organized and the family and community welcoming, the exotic beach location where the volunteers stayed was the icing on the cake. Of course, locations like that also have their cons, like heat and an array of insects. But Turner-DeJesus expects the Nicaraguan Fuller Center to become a very popular destination for Fuller Center volunteers looking to change lives outside the United States through the Global Builders program. To see more pictures from the first two Global Builders trips to Nicaragua, click here. Fuller Center finds smiles amid shacks on Nicaragua’s Pacific Coast. 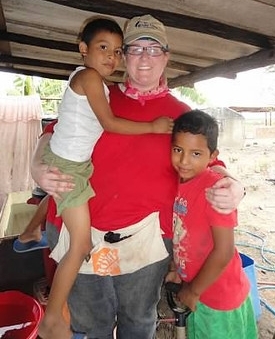 VOLUNTEER PROFILE: Global Builder Brenda Sawyer addicted to volunteering.